Industrial robots have been adopted in factories worldwide for more than 50 years. In recent years, due to ever increasing wages, diminishing worker supply and shortened product life in consumer electronics, industrial robots are required to be more intelligent for the purpose of cooperation with human and replacement of some workforce. Adoption of intelligent industrial robot enables the enhancement of the flexibility of manufacturing line, in which the lines are able to be efficiently reconfigured for multiple products. To handle such complex tasks in flexible manufacturing, an intelligent industrial robot must be equipped with eyes and brain, which are key capabilities of humanoid cognition. ASTRI is developing whole-field 3D scanning technology of high accuracy and high speed for robotic eyes. To enhance 3D robotic visual perception, ASTRI will develop the IP protected platform technologies, including stereo-based phase shift 3D measurement algorithm and digital pico projection-based 3D scanning systems. The technologies developed in this project can be deployed in a wide range of applications, including 3D randomised bin picking, pick-and-place, assembly, navigation, body scanning for garment manufacturing, 3D printing, etc. ASTRI is also developing machine learning based 3D object recognition algorithm. 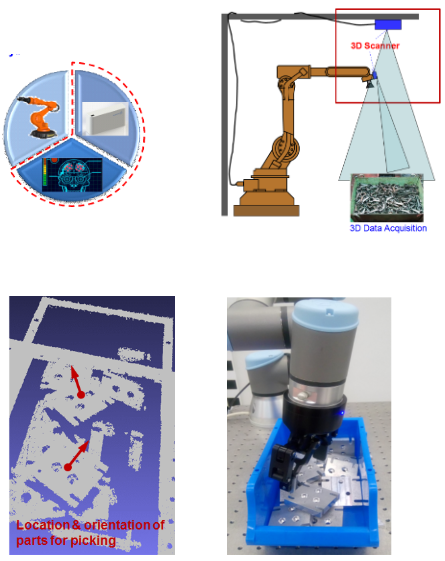 The outcome of 3D object recognition algorithm will provide guidance to the robotic manipulation, by recognising available parts for picking among a large amount of randomly placed parts, and also computing picking location and orientation.